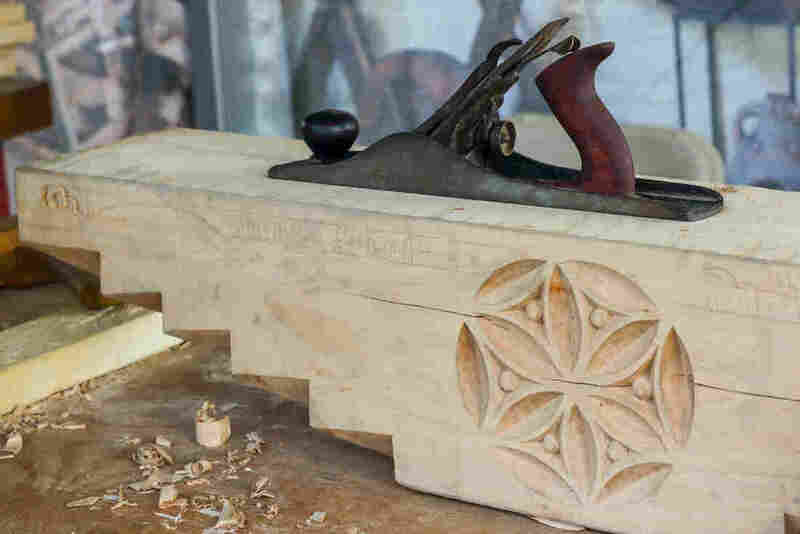 A Woodcarver From Armenia Brings Ancient Traditions Into The 21st Century : Goats and Soda For Vahagn Amiryan, the act of carving wood is a way to bring the country's ancient traditions into the modern era. 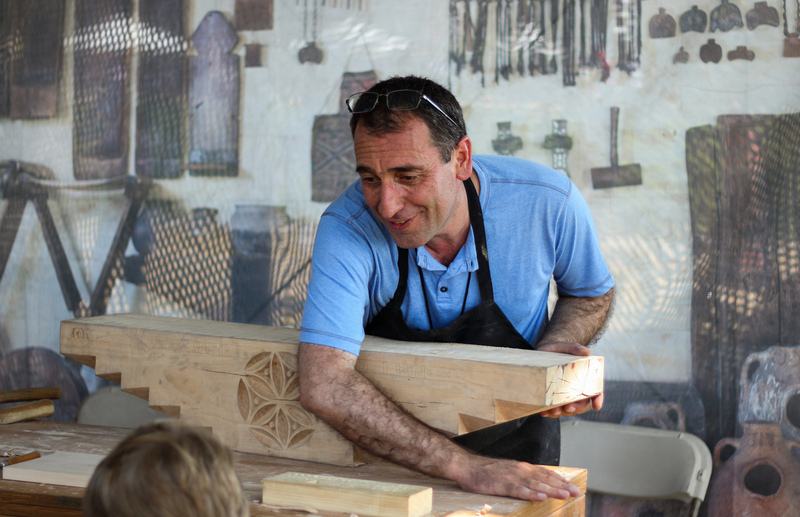 At the Smithsonian Folklife Festival in Washington, D.C., Vahagn Amiryan of Armenia prepares to carve an inscription on a block of wood that would sit atop the "mother pillar" inside a traditional house in his country. Wood has a special place in Vahagn Amiryan's heart. It can bring Armenia's ancient past into the modern day. The act of carving wood into traditional Armenian furniture and decor — and amulets to ward off the "evil eye" — is "a way to connect with the roots," he explains through an interpreter at this summer's Smithsonian Folklife Festival in Washington, D.C.
Amiryan, in his early 50s, spent two weeks sharing the art of Armenian wood craft with visitors around the world. This year, the event highlighted the middle-income country of Armenia, a former Soviet republic in the Caucasus mountains. Over the past few decades, Amiryan has been working to preserve the art of woodcarving in his country. "I started loving wood long ago," Amiryan says. "I like wood a lot as a material: its warmth and liveliness." Woodcarving has been a component of Armenian culture for centuries. Carvers traditionally made utilitarian items, such as ladles and spoons, as well as decorative ones, like figurines and ornaments. But by the 1970s, industrial machines had replaced artisans in producing everyday goods like kitchenware and furniture, and the craft began to die out. In 1977, a master woodcarver named Henrik Solakhyan founded the Museum of Woodcarving in Yerevan, the country's capital, to help revive the tradition. That's where Amiryan's love for woodcarving began. When he was 12, he walked into the museum and began learning the craft from Solakhyan. Today, Amiryan is a teacher and woodcarver at the museum, carrying on Solakhyan's mission. Under a white tent at the Smithsonian festival, he carves a flower-like pattern on the face of a four-foot beam. Wood shavings fly onto his white apron. Glasses sit atop his nose, and a few strands of gray punctuate his short, dark hair. A daghdaghan, or Armenian amulet, carved by Vahagn Amiryan, is said to protect the owner from evil spirits. An inscription is penciled out across the face of the beam in Armenian script, marking letters that will soon be carved out by Amiryan's gouges and chisels. As he reads the inscription, a smile spreads across his face. "May your family be prosperous" is the meaning of the inscription, he says, adding, "Your family is the whole household. It includes parents, grandparents and the fireplace around which people gather. It has a collective meaning." The decorated beam will eventually sit atop the "mother pillar," a structural support that Amiryan says is the literal and symbolic center of a traditional Armenian home. Once finished, the beam will connect the mother pillar to the ceiling. "The pillar represents the foundation of the family, and the foundation of life," he says. "The pillar connects the sky and the earth together." Amiryan also specializes in carving daghdaghan, flat palm-sized amulets that date back thousands of years. The amulets are meant to protect their owner from the "evil eye," he says. According to Amiryan, daghdaghan need to be carved during certain times of the month when friendly spirits are present to lend their power to the amulet. "There are specific times that people make the amulets," Amiryan says. These are determined by the lunar calendar. "They're done at night, under candlelight." When carving a daghdaghan, Amiryan says you're supposed to remain completely silent so that friendly spirits are not scared away. Even something as seemingly innocent as blowing away the wood shavings can startle them, he says, and then the daghdaghan would lose its protective qualities. These amulets and other wooden crafts are working their way back into the national consciousness, Amiryan says. More and more, he is seeing them for sale in markets in Yerevan. 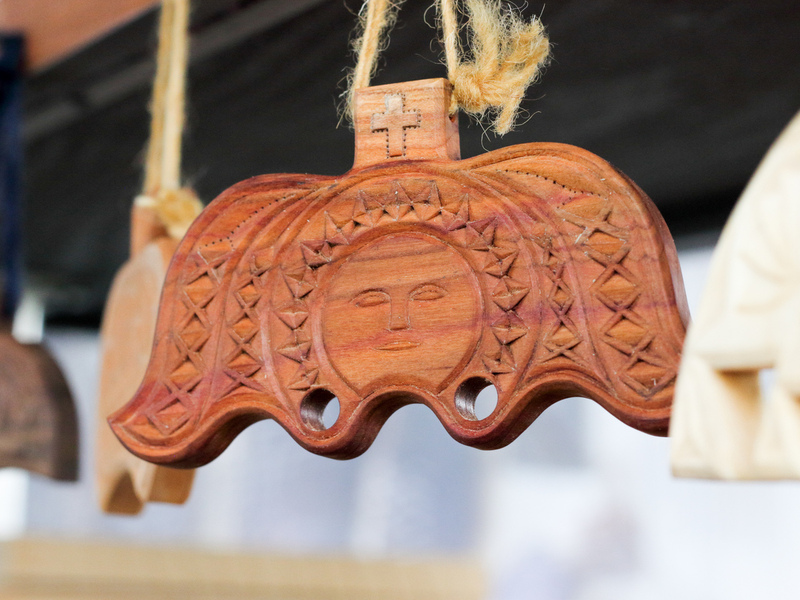 In September 2017, a daylong open-air exhibition called My Handmade Armenia was held in Yerevan. It featured several forms of traditional art, including woodcraft. Artisans demonstrated and sold their handiwork to visitors. At the Smithsonian festival, spectators drift in and out of Amiryan's tent. He pauses from his woodwork to answer questions through an interpreter. At one point, Amiryan hands a particularly curious onlooker a chisel and a scrap of wood and coaches him through some basic techniques. He smiles as the young man carves a series of geometric patterns in the face of the wood. "You're getting better," Amiryan says. It's clear that Amiryan draws joy from his work. But sharing it with others seems just as important.